Pride of place this week goes to Eilis Murphy and Cara McKervey who became Ulster Handball Champions at the weekend writes John Murphy. They become the first girls from the RGU and Down to win a provincial title and they bring tremendous credit to the work and efforts of those involved in handball in the club. Well done to them both and their coaches Jim Cunningham and Tony O’Connor along with the girls parents who done so much work to get them up to this level. 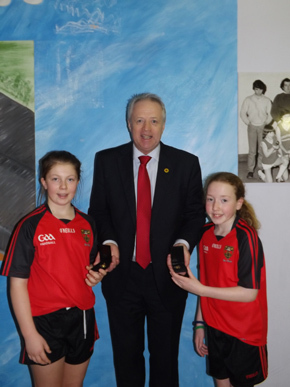 Eilis Murohy and Cara McKervey are proud winners of the Ulster handball title. medals from Ulster GAA President Martin McAvinney. This is a tremendous achievement for the girls, their coaches along with the support of their parents. Congratulations and well done to them all. Juvenile training schedule:- U-6 Boys and Girls (P1 & P2) at 10.30am Saturday at Ballymote; U-8 Boys & Girls (P3 & P4) at 10.30am Saturday at RGU pitch; U10 Boys (P5 & P6) at 11.30am Sat at RGU pitch; U12 Boys (2002 & 2003) at 7pm Tue at Down Leisure Centre; U-10/12 Girls (2002, 2003, 2004 & 2005) at 11.30 Saturday at Ballymote and 6pm Wed indoors at RGU; U-14 Girls (2000 & 2001) at 7pm Tue and Sat 11.30 at RGU Pitch; U-14 Boys (2000 & 2001) at 11am Sun and 7pm Thur at RGU pitch. Please leave contact details with managers in case change of times/venues. The RGU schools programme continues with the P5s on Monday and the P-6’s and P-7’s on Thursday and Friday respectively. Just return your school permission slip as soon as possible, all free of charge. All welcome, don’t worry if you miss the first week you can attend at any time. Membership forms will be given out for each team as they start. You will not be able to train if you are not a registered member; membership is only £25 each with discounts for 2 or more children. U-6 membership is only £5. Advance notice for Cul Camp Summer 2014. The provisional date for RGU Cul Camp is week 2, 7th-11th July. More details as soon as they are confirmed. RGU are taking part in a sponsored relay race to help raise funds for Rith 2014 which supports the Irish language. The event starts in Cork and comes to Downpatrick on Sat 15th March. Community groups and gaelic clubs all over Ireland are supporting this event. Boys and girls from the age groups below are requested to attend at the following locations at 9.30am sharp next Sat 15th morning. U-12 Boys – Site of the old Killough Rd Community Centre on Ballynoe Rd. U12 Girls & U10 Boys – Junction of Brannish Rd and Struell Heights. U8 Boys & Girls – Junction of Cloonagh Rd (MOT Centre) and Struell Heights. 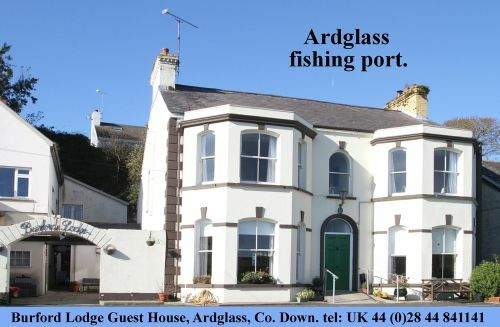 Everyone will run up to the junction with Ardglass Rd where the relay baton will be handed on to the next group. The runners will be looked after by the race organisers and club mentors. Everyone will then return to club for normal training which will be over at 11.30am, so remember trainers and boots. A date to keep in your diary for those who love a bit of theatre, the comedy play based in rural Ireland in 2001 ‘A Lock of Fierce Roars’ is coming to RGU on Saturday 12th April. Tickets £10. Contact Edel Curran on 07759 418 419 or any Executive member for tickets. Ulster Ladies Council will be holding a workshop for rules update and player injury fund at RGU on Thur at 7pm. All local Ladies clubs welcome.